North American Carbide is a manufacturer of carbide indexable inserts providing quality products and the utmost in service to distributors and end users. Application expertise is the foundation of our business, combined with on-going support for precision-ground carbide tools. We provide cost-effective solutions, each one designed to fit a customer’s unique needs and increase productivity. We offer individual service and products tailored to your needs. Special designs, coatings, edge preparation, as well as expert advice and consultation are all part the NAC offering. Allow us to become a valued partner and bring real results to your bottom line. 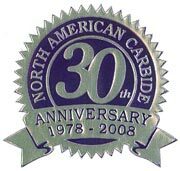 North American Carbide, Inc. is a true leader in the fabrication and distribution of carbide products. With years of industry experience, our company is widely known for its partnering with customers while providing innovative solutions to improve quality, productivity and service. Responding and adapting to the constantly changing global business environment is not just a challenge, but a time honored commitment, in our industry.